A six bunk hut with a woodburner stove newly erected at this site in April 2012. This is the 3rd site for this hut. It was originally sited at Quartz Creek in 1968 and then shifted to Boulder Stream in 1983. It was removed from there in 2012, revamped in Renwick and then rebuilt at the current site. 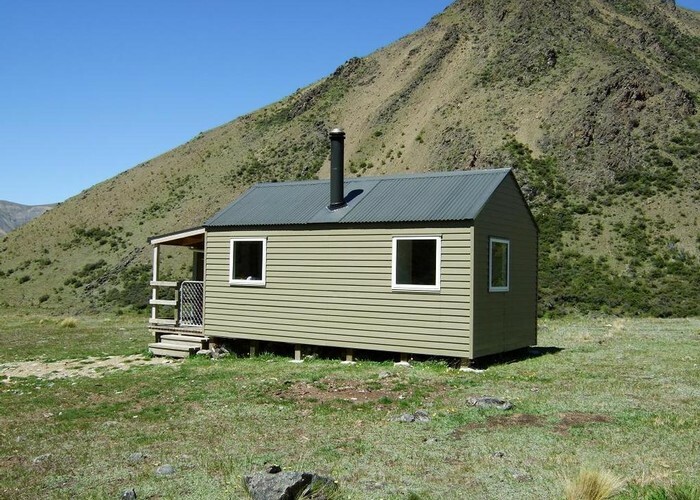 This hut has been provided for overnighting on the East - West & Leatham - Molesworth routes in the Molesworth Recreation Reserve. To date it has had little use. Apparently some water courses can be problematic to cross outside of dry summer conditions and this has thwarted some parties. My mate was told by DOC that they may be putting in at least one bridge to make things easier. A lovely job seems to have been made of the hut & there are two swish stainless steel benches inside. One criticism is that the top bunks are too close to the hut ceiling! There is room for them to be 200-300mm lower without cramping the bottom bunks. Saxton Hut Dec 2013 • By glennj. Licence: C.
1/ From near the Saxton River bridge on the Molesworth Road. The track starts from the roadside 0.7km up the Acheron beyond the Saxton bridge. i.e. TL of the Saxton. It's an easy 1hr up to the hut. 2/ Thru from Severn hut over Point 1764m and down Boundary Stream. The DOC guideline time is 8-9hrs but this was misleading. I cruised it with one 15 min stop in 3hrs 45mins & the previous day a tramper recorded in the hut book that it took him 4hrs 20mins. 3/From Top Gordon hut via Saxton Saddle. Added 5 December 2013 by glennjglennj. No revisions. 123 views in the past year (10 per month).